What are people saying about the G20? 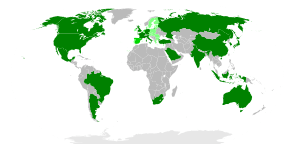 The Global Campaign for Education expressed disappointment that the G20 did not progress further on a financial transaction tax that could go someway to filling the gap in funding left by the G8. Save the Children called on the G20 to broaden their impact as a forum. Save the Children US said the G-20 isn’t moving quickly enough to offer the kind of global economic leadership that ensures balanced growth and stability by improving the resilience of the world’s poor. The agency saw some encouraging language on narrowing the development gap, but it took no major, new action at this summit beyond establishing a working group and and reaffirming the importance of food security. Oxfam says the G20 has drawn a blank on poverty. WWF warned that sustainable economic recovery needed more than brief platitudes from the G20 on green recovery than what it delivered in Toronto. The agency said that the world leaders were still painting the economy in black and white but it must inlude green. Actionaid UK said the G20 was bankrupt as the leaders lacked ideas and and any willingness to compromise. The organisation said the communique would be forgotten before the day was over. World Vision applauded and welcomed the cancellation of Haiti’s International Financial Institutions (IFI) debt and the creation of G20 Working Group on development. The organisation did express concern that the development agenda is taking a back seat to economic growth. Tearfund said the G20 was a missed opportunity to show leadership on climate justice and to set a path to get back on track for a global deal post 2012. Greenpeace said “important progress was made today in ending fossil fuels”. Make Poverty History expressed concern that the G20 dealing with budget deficits through cutting back on government services will end up hurting the poor. The ONE Campaign issues a statement at the end of the G20 Summit stating that the two working groups created in Toronto on development and on anti-corruption needed to focus on improving governance and mutual accountability. The Global Call to Action Against Poverty (GCAP) said the G20 summit showed an unfortunate lack of political will to fight poverty by delaying key actions such as the Robin Hood Tax and investing in clean energy and ending fossil fuel subsidies. The group also said the G20 needs to include Africa as a regular member. The group welcomed the establishment of a Working Group on Development. This entry was posted in Extreme poverty, G20, NGO and tagged G-20 major economies, NGO, Toronto.